If you have ever bought or sold a house then you have benefitted from our publicly owned Land Registry. Since 1862, the Land Registry has been recording the ownership of land and property in England and Wales. 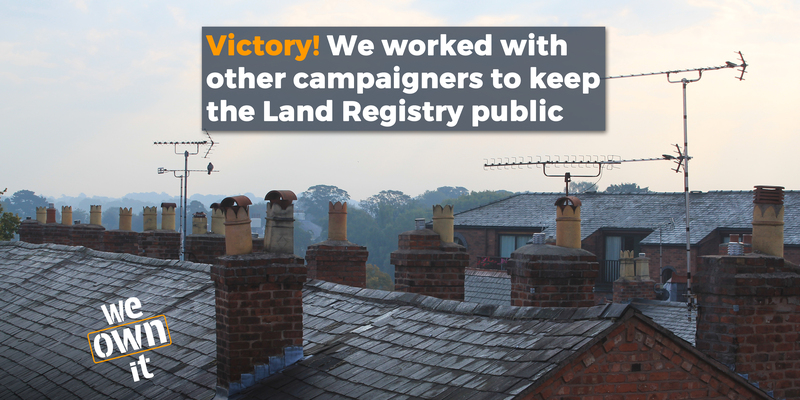 In 2016 we joined other campaigners - including PCS union, 38 degrees and lawyers - to help stop the privatisation of the Land Registry. Our research showed that if we sold off the Land Registry, then in just 25 years time we would be losing out on profits. And the government dropped its sell off plans - we won! With over 24 million titles, underpinning guarantees for £3 trillion worth of property, the Land Registry performs a crucial role in our economy. Not only does the Land Registry not cost you a penny, but it has returned a profit to the Treasury in 19 out of the last 20 years, while continuing to offer you lower fees. The Land Registry consistently reports high levels of public approval – with a customer satisfaction rate of 94%, and an 80% satisfaction rating for its online services. To continue to make life easier for consumers, the Land Registry is also planning moves to increase digital services. The proposal to make Land Registry data free and easy to access would be brilliant as it would allow you to see who really owns our land. This idea has also been strongly supported by the housing charity Shelter, who argue more open data would help the market work efficiently and more homes to be built.